Hi guys! Wheee, I did some shopping in Germany last week! And of course I visited Kiko and Dm for some pretty polishes! For those who don't know these stores, Kiko is a really inexpensive make-up brand that has wonderful polishes and Dm is a drug store that sells the cheap but fantastic brands Essence and P2. 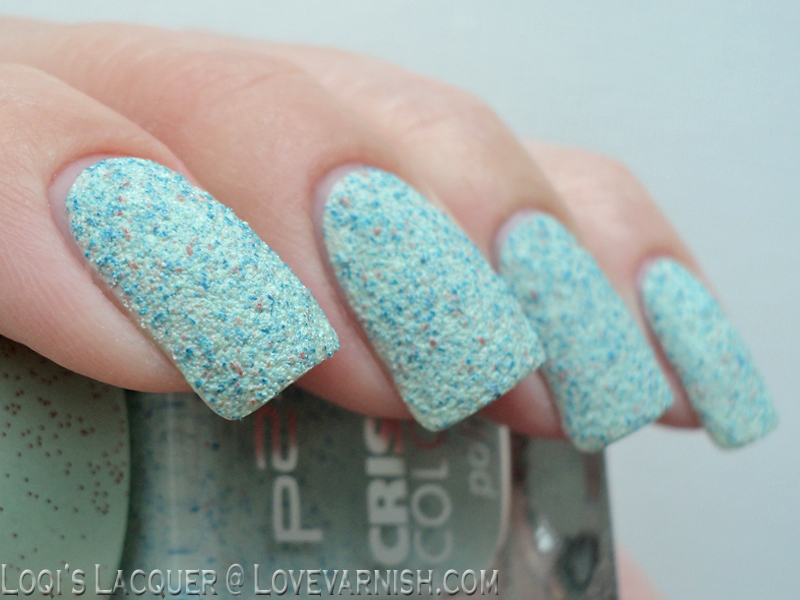 So I've got lots of new goodies to try out and today I am showing you 2 polishes from the new P2 Crisp Color collection. The P2 Crisp Color collection is a new collection of 10 pastel polishes that came out this spring, and they are textures! As you guys know, I love texture polishes and especially the ones from P2, so I could not pass up on this collection. And these are so interesting! Not only are these textures very matte, they also have contrasting colours mixed in which looks really cool! I am showing you the 2 I thought were prettiest. Cool milkshake is the minty green polish and Blueberry dots the soft blue one. As you can see they both have dark blue and orange spots in them and they are really very textured. They are still quite smooth overall though, the extreme texture didn't make any big ugly lumps. They were also very opaque, I used 2 coats for both polishes, and wear time was great! I really loved wearing these, I didn't have any completely matte texture polishes yet and I think they look awesome! What do you guys think? Do you like them? Or are you done with textures? Let me know in the comments and see you next week! Weird, but wonderful! I am not too sure I can pass this when I am in Germany despite a "no-buy". I am sure that these are quite similar to some NOPI polishes from last year but p2 is so much more affordable. Gotta love dm! They both look great ! I love textured nail polishes, and these ones seem to be amazing ! These polishes are very unique. I see some lovely beach themed nail art with these. I don't even know how I feel about textured polishes anymore. Last summer I couldn't get enough of them. Now a I a ton and have only used three of them one time each on accent nails, so I don't know. These truly are interesting! Yes I would wear these, even though I usually like my textures to be glittery! I love textured polishes. I have never seen any quite like this though. What a find! They are beautiful and super unique. These are really pretty colors! I'm not the biggest fan of texture polishes, but I like the different colors in these! I'm not much for texture polishes but the color combo of these is amazing - I really like them. They do look a lot like the NOPI polishes, so pretty! Good luck with your no-buy! They are amazing, I want the whole collection now! Oh that's a shame :( maybe revisit some of them? It might spark new interest! :D I'm actually wearing a glitter texture now, I also love those! I agree, they are just wonderful and so cheap! Oh my. I didn't know that collection. They do look the same haha. Oh well, I don't mind. I usually can't get my hands on LE Kiko polishes. The contrast is fun right? Ik hou van zulke lakjes! Heb zelf ook een aantal van Yes Love. Prachtige swatches! I had no idea you can't get P2 in The Netherlands! This collection looks exactly the same as a limited one by Kiko from last year! I like the specks of different colours, overall I'm not a big fan of gritty textures though! I'd never heard of this brand before, I'll have to check them out! I love textured polishes and the ones from P2 are really nice. they remind me a lot of the Kiko textured polishes they had a while ago. I believe they were called Cupcake polishes. These are super gorgeous! I am such a huge fan of texture polishes. Although I'm not a big textured fan, I do love both of these! I wish we had Kiko and P2 here, but maybe it's good they are not. I already spend too much on polish! I'm still a texture fan. I just never get tired of them! Love these!